The journalists toured a state-of-the-art eco-textile factory outside of Ningxia’s capital Yinchuan. The factory will soon become the processing facility for cotton grown at southern Queensland’s sprawling Cubbie Station, owned by Chinese consortium Shandong Ruyi. They also visited a vineyard on the slopes of Mt Helan, established with technical support from South Australian wine-making experts. To get a sense of the government’s economic strategy in western China, the group met with regional representatives of the National Development and Reform Commission, which is driving the “Silk Road Economic Belt” plan for increased industrial development in western China and trade with the Middle East and Europe. Leading the Australian group, Melbourne Press Club CEO Mark Baker said the time spent in Ningxia was the highlight of the trip. “We were extended a very warm welcome by the provincial journalists association and the local government – including high level briefings. Visits to cultural, religious and tourists sites gave the fellows a rich experience of life in the small but dynamic region. “I believe the fellowship program is an outstanding, and I suspect unique, opportunity for mainstream Australian journalists to gain an understanding and appreciation of China – its people, its economy, its political system and its culture”, Baker said. 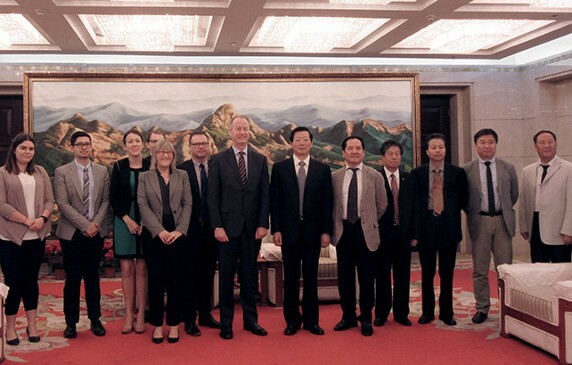 In Beijing, the group visited the Ministry of Agriculture to discuss the soon-to-be-implemented free trade agreement between China and Australia and the China Institute of Contemporary International Relations, an influential government-affiliated think-tank, to discuss the Asian Infrastructure Investment Bank. They also had discussions with Australian embassy officials and academics at Peking University’s Australian Studies Centre, including BHP Billiton Chair Professor David Walker. Australian journalists taking part included: Sheryle Bagwell, ABC Radio Breakfast; Ed Gannon, Herald and Weekly Times; Angela Pownall, The West Australian; Jason Tin, The Courier Mail and Sunday Mail; and Brett Worthington, ABC Rural. RMIT journalism student Rebecca Colquhoun joined the tour as an intern and reporter for the ANZ Banking Group’s online financial publication BlueNotes. ANZ is the Australian sponsor of the exchange program, which is a collaboration between APJC and the All China Journalists Association. The “other half” of the exchange takes place later this month, when six Chinese media people visit Sydney and Melbourne. “This was my first visit to China in 25 years and the transformation of the country is outstanding. But it was gratifying to see that authorities in Beijing have done a good job to preserve what remains of the city’s great historical and architectural heritage, ensuring most of the high-rise growth is taking place away from the central city area.